Sahara One's Hanuman Serial - New Mytho! Tellybuzz just published an article on a new mytho which the Sagars are directing on the life of Bajrangbali Hanuman. 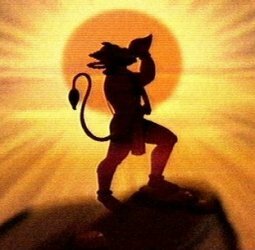 There was once a Mahavir Hanuman which aired on Colors' channel, but it became a flop with viewers because of the mediocre technology and lapses in storyline, and this new venture of the Sagars is being supported by the channel since it produced many other mythos before which became popular with viewers. I really hope this mytho also becomes a success, I would love to see a show based solely on the life of Hanumanji. Sahara One gears up for a mytho on Hanuman..
Sahara One and Sagar Arts are now planning a mythological show on the life of Hanuman..
Sahara One which has come up with various mythological shows like Mata Ki Chowki and Ganesh Leela is now planning yet another large scale venture with Sagar Arts which will be based on the life and journey of Mahavir Hanuman..
Our source states, "The show is at a very initial stage with the casting process still on. The mytho is being produced by Sagar Arts and is tentatively titled 'Jay Jay Jay Bajarangbali'". Talking about the concept our khabroo says, "The show will execute the whole journey of Hanuman from childhood to the span of time where he goes to Lanka, as the Dhoot of Lord Ram. There would be a bit of Ramayan also shown, but the show on the whole will majorly focus on the life of Lord Hanuman". A spokesperson associated with the show confirmed that Sahara One and Sagar Arts are working on such a concept. We tried contacting Mushtaq Shiekh, Creative Director, Sahara One and even sent him a text message, but did not get any reply till the time we filed the story. Wow, great news! Can't wait! I've watched bits of Mahavir Hanuman and saw Mandar Jadahv act as Ram. Wasn't overall impressed by the show though. Hope this will be better. I know, I really hope the Sagars live up to our expectations with this show, hope it will be good. I know, same here...the first two episodes of Mahavir Hanuman were okay, but then it got really boring...in general though, I did not like the dark brooding settings, perhaps they would fit in a Hollywood movie, but not in a mytho where we expect some colorful glowing settings. I did not get to the part where Mandar Jadav entered the show, because I quit during the Bal Hanuman leelas. But I think the show was cut midway because of highly low TRPs, right? Haha, nice way of putting it, one Saas-bahu soap less indeed. I think we'll always have a special place in our hearts for Dara Singh, he created a permanent niche for himself as Lord Hanuman, but you're right that they should choose a good actor. Even if other actors are good, a show is not watchable if the main character is mediocre, know what I mean? Awesome news! I too hope it lives up to our expectations! Can't wait to see who they cast as Lord Hanuman! Thanks for sharing the article here Janu.